Please note our new phone numbers. increase in natural gas usage by 2010 in China. Mr. McElwrath, before joining Far East Energy, was Vice President of TMP/Hudson Global Resources, TMP is the parent company of Monster.com. He served as Acting Assistant Secretary of Energy in the first Bush Administration, charged with development of the nation’s coal, oil, and gas policies and with management of $2.1 Billion in programs including the Clean Coal Program, the National Oil and Gas Research Program, and the Strategic Petroleum Reserve. He was an International Negotiator and Policy Advisor in the Reagan administration. Upon leaving the Bush Administration he had stints as Director of the National Institute for Petroleum and Energy Research and Director of British Petroleum’s outsourced exploration and production lab for the Americas. In addition, Mr. McElwrath has held a number of Senior Executive positions in the energy industry. Mr. McElwrath holds a J.D. from the University of Texas School of Law, as well as a B.A. Honors Program. Mr. Huff brings more than 30 years of financial experience with emphasis on domestic and international oil and gas exploration /production. Mr. Huff spent 13 years with Harken Energy Corporation, holding the positions of President and Chief Operating Officer and other capacities including Senior Vice President, Chief Financial Officer and Director. In his industry experience, Mr. Huff has been responsible for a wide range of functions including strategic planning, financial, legal, information technology and investor relations. He has experience with acquisitions and divestitures, capital financings with common and preferred stock, U.S. and European convertibles and bank-project financing. Mr. Huff’s background also includes 20 years in public accounting, including positions with an international accounting firm in Dallas, Texas where he served in the audit department serving numerous public companies and as President of a local accounting firm in Abilene, Texas servicing oil and gas, banking, and other industries. Mr. Huff has co-authored several books and published articles on auditing small businesses and quality controls as well as training courses for those services. He graduated with a BS in Accounting from Abilene Christian University. Mr. Huff is a CPA and has been a member of the American Institute of CPAs, the Financial Executives Institute and the Independent Producers Association of America. The Texas Society of Certified Public Accountants named Mr. Huff the Outstanding Young CPA for Texas in 1983. Mr. Ward’s career spans 23 years in the petroleum industry, where his primary focus has been on the evaluation of oil and gas properties throughout the United States. He has been involved in the evaluation of coalbed methane prospects, primarily in the San Juan and Powder River basins, since 1992. In addition, he has over 20 years’ experience in petroleum software development and has written numerous programs for use in the evaluation of oil and gas assets. Mr. Ward previously served as reservoir manager for 3TEC Energy and as Vice President of engineering and production for Floyd Oil Company. He holds a Master of Science degree in Petroleum Engineering from the University of Houston, is a registered professional engineer in the state of Texas and has been a member of the Society of Petroleum Engineers since 1978. Dr. Yang is a well-known geologist, and is recognized as a preeminent CBM expert in China. He received his Ph.D in Geology from Texas A&M University and has 22 years of working experience in China’s energy industry and universities (teaching and research). He was among the pioneers in introducing CBM exploration and production to China, and assisted CUCBM in its early stages of formation. From 1993 to 2001, he worked as Chief Geologist and Senior Consultant for Amoco/Arco/BP CBM projects in the Ordos and Qinshui Basins in North China, and played a leading role in developing their projects and operations. 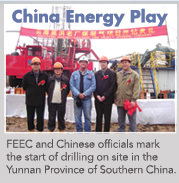 Also, Dr. Yang has established personal/business relationships with numerous key people in the Chinese government and energy industry (CUCBM, PetroChina, Sinopec, China Univ. of Mining & Tech., and China National Administration of Coal Geology), which greatly benefits FEEC’s project execution and business development in China. Mr. Mihm was the Senior VP of Technology and Project Development for Phillips Petroleum Company (later ConocoPhillips) until his retirement in February 2003. Mr. Mihm has 40 years of experience in the oil and gas industry. Mr. Mihm was involved in supplying technical support for the ConocoPhillips Shanxi project prior to its farmout to Far East Energy. Mr. Williams is presently vice president of Maurer Technology, a drilling technology subsidiary of Noble Corporation. Williams held senior executive positions at the Department of Energy and the Department of Interior during the first Bush administration, following which he served as business development director at Houston’s Westport Technology Center, a leading upstream oil and gas research company that was acquired by Dresser Industries which later merged with Halliburton. Williams is co-founder and serves on the board of directors of Cementing Solutions, Inc., an oil and gas cementing and technology company based in Houston. Williams serves on a number of professional oil and gas organizations, associations and boards including the Independent Petroleum Association of America, the Petroleum Technology Transfer Council’s advisory group and national board, the Texas Independent Producers and Royalty Owners Association, the Society of Petroleum Engineers, the American Association of Drilling Engineers and others. He has authored more than 100 energy publications and articles during his 20 years in the industry. Don Juckett, now consulting throughout the energy industry, retired from a long career at the Senior Executive Service level with the United States Department of Energy (DOE) in 2003. While there, he held posts as Director of the Office of Natural Gas and Petroleum Import and Export Activities, Director for Natural Gas and Petroleum Technology, and Acting Deputy Assistant Secretary for Natural Gas and Petroleum Technology. He conceived and organized the U.S./China Oil and Gas Industry Forum, a government/industry platform that enhanced China’s petroleum sector opening to outside investment. Prior to joining DOE, Mr.Juckett worked for Phillips Petroleum in exploration and production technical services and research. He has a Ph.D. in organic chemistry. Mr. Keys is currently CFO of BPZ Energy, Inc. and a partner with Tatum CFO Partners LLP. Mr. Keys previously served as Chief Financial Officer of Transmeridian Exploration, Inc., a public oil and gas company with operations in Kazakhstan. Mr. Keys has over twenty years of financial management experience in the energy industry. From 1998 to 2001, he served as Chief Financial Officer of Core Laboratories N.V., an NYSE - listed global oilfield service company and one of its acquired entities. Prior to Core Labs, he served as CFO for 3DX Technologies, Inc., a NASDAQ - listed oil and gas exploration company, Treasurer for Norcen Explorer, Inc. and in progressive financial management roles at Santa Fe Energy Resources and one of its predecessors, Adobe Resources. Keys began his career with the public accounting firm of KPMG Peat Marwick and is a Texas CPA. Mr. Whyte is an investment manager with Sofaer Capital Inc. based in London. Mr. Whyte serves as an independent director and representative for an investor group in a $10.25 million private placement with Far East Energy closed on December 21, 2004. Mr. Whyte has an extensive investment background and a wide range of corporate finance experience. Mr. Gunther currently sits on the Board of Directors for Williams Energy Partners, (NYSE:WEG), which is principally owned by Williams Companies, Inc. (NYSE:WMB). Mr. Gunther has formerly served as Vice Chairman for the Bechtel Group of companies, served on Bechtel's Executive Committee, and served on Bechtel's Board of Directors. Mr. Gunther was formerly President of Bechtel Petroleum -- Chemical and Industrial Company, and President of Europe, Africa, Middle East, and Southwest Asia regions. Professor Wang has 40 years of experience in mineral processing, specializing in coal and minerals in China with a specific focus on Yunnan Province. Professor Wang was a research fellow at the University of British Columbia in the Mineral Processing Department from 1983 to 1989. He has served as Vice Director of the Kunming Metallurgical Research Institute in Kunming, Yunnan Province and currently consults to the Institute on a wide array of projects. Dr. Laxminarayana (Laxmi) Chikatamarla has more than 21 years of experience in technology, management, policy planning, and evaluation of coal deposits and coalbed methane resources for exploitation, development and construction of coal projects and coalbed methane research. He is presently working as a Post Doctoral Research Fellow on ‘Acid Gas Sequestration’ project with Professor Marc Bustin at the University of British Columbia (UBC), Vancouver, Canada. Dr. Chikatamarla holds a B.S. in Mining Engineering, post graduate diploma in computer applications, M.S. in Rock Mechanics (engineering geology) from the Indian Institute of Technology, Delhi, India and a Ph.D. in Geology specializing in Coalbed Methane from James Cook University, Townsville, Australia. He has presented several papers in national and international conferences and has published articles about coalbed methane in international journals. Mr. Parkin has over 25 years of experience in international finance and investment. He has served as director and fund manager with leading British institutions such as American Express Bank, Foreign & Colonial, Govett and Edmund de Rothschild. Mr. Parkin was trained as an economist; he holds Master of Philosophy degree from the University of Oxford and a B. A. with honors from the University of Warwick. 05/20/04 -China's energy appetite fuels record prices.